Now Hiring TEAM MEMBERS and SHIFT LEADERS! Whether you shop online or at most big box stores, you rarely get any personal interaction. At Pet Supplies Plus, we are all about being friendly and neighborly to our pet parents and their pets. We run our stores like the generations before us did. We focus on building relationships with people and have created a culture that is incredibly hard to replicate. How? We get to know our neighbors and their pets. We don't believe in just selling pet supplies, but we believe in creating an experience that is positive and friendly for everyone who shops. 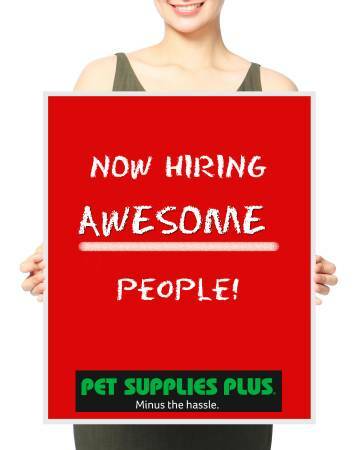 As a team-member at Pet Supplies Plus, you have the ability to bring happiness and solutions to hundreds of people each week. You will become the go-to expert on a variety of pet care needs. Our company is independently owned and maintains a transparent operational mindset. While many of today's retailers are shutting down stores, we continue to expand, take on new markets, and believe in promoting from within. We have become "America's Favorite Neighborhood Pet Store" and are looking for individuals who understand people and pets alike, and will contribute to our culture of being knowledgeable and petcentric! Competitive pay and advancement opportunities on a regular basis. Hands on training from some of the industries leading professionals. A competitive employee discount program. Flexible hours and support in your personal career and educational goals. An environment where you can contribute, belong, and help people and pets have an easy and refreshing shopping experience. APPLY ONLINE: Choose a location and apply.